Jackie is from Hayward, CA. During High School she earned Hayward All-Stars, 5 All Tournament awards, and was titled as Most Athletic of the class of ’09. Her hobbies include downloading music, dancing, and hanging out with friends. Her dream job is to be a pilot for the Blue Angels. Jackie hopes to contribute to the team and improve on her game this year. She is able to push the ball up the court and ignite a fast break. 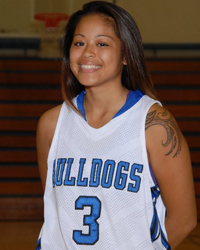 Her speed and athleticism will help the Bulldogs attack this season.